Let me start this blog off with: I never get embarrassed. I hate when people try to purposely embarrass someone. So to avoid that and just being embarrassed in general, I decided one day in college that I wasn't going to get embarrassed anymore so I don't. Don't like get all excited. I'm not trying to go all 'eat pray love' and inspirational and start a movement on you or get this blog picked up by Thought Catalog, I'm just stating something, so calm down. With that said, no one said I wasn't awkward. It's just that I typically own my awkwardness and go with it. So with all that said: story time. PMS: "Oh, you know. Just saving the world." AM: "Oh? Is that an 'S' on your chest?" PMS: *Silent but thinking* What? An S on my chest? Is he referring to my chic Free People gold choker I'm wearing? Does it look like an S? Then I start thinking, should I say man or woman, like I was genuinely sitting there overthinking if it would be better/funnier/more politically correct/make me a better feminist to say Superman or Superwoman and then I was like, should I tell him I don't watch superhero movies, well if I had to pick a favorite superhero it would be Superman because he's the most like Jesus, should I tell him that, then I started thinking about that horrible Charlie Puth song ALL WHILE THIS MAN JUST STARES AT ME. AM: "Yeah. You thought I was just looking at your chest?" I will not get embarrassed, I will not get embarrassed, I am above this, I can make this a funny interaction, I can save this, you're witty, you're quick, you're mentally sharp, think PMS, think. YES I AM. CONGRATS. YOU FINALLY EMBARRASSED PMS. 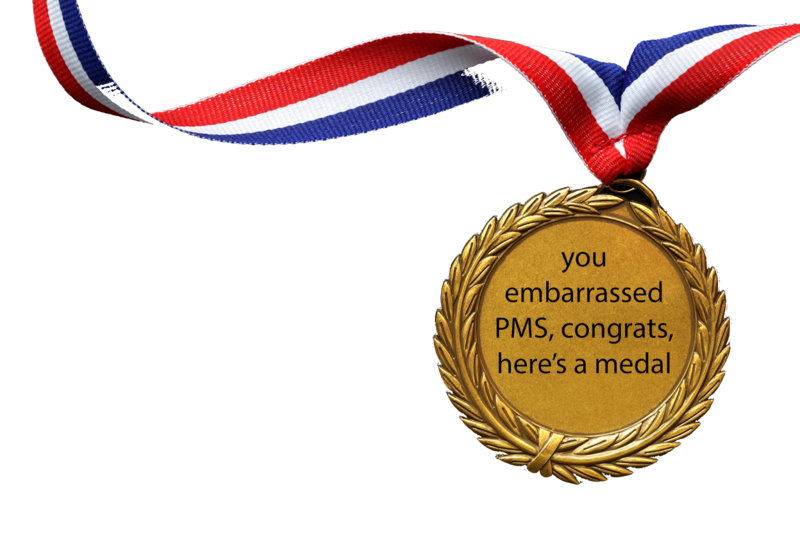 HERE'S YOUR MEDAL. PMS: "This conversation is over." I survived the interaction because I'm a survivor thank you for your continued support I'm never going to get married.